Asthma is a chronic inflammatory disease which affects the airways – the small tubes that carry air in and out of the lungs. On response to a trigger, the muscles around the walls of the airways tighten and become narrower. The lining of the airways also produce a sticky mucus. As the airways narrow, it becomes difficult for air to move in and out. As muscle tone is required for inhalation and muscle relaxation is required for exhalation, a common and noticable issue with asthma is a difficulty in exhaling. A number of factors can trigger an Asthma attack; most of these air airborne irritants or particulate but other environmental, physical or emotional factors can cause or exacerbate the symptoms. Knowing these factors can help you prevent a casualty from experiencing an attack or help relieve the symptoms by being aware of their environment or changing their behaviours. Emotions - Stress, depression, anxiety or even a fit of laughter can trigger asthma symptoms. Asthma is commonly treated with an inhaled medication; a delivery route which is very fast acting. It can also be controlled by parental (digested) medication. A casualty suffering from an asthma attack needs their medication as quickly as possible – an inherent problem with breathing condition that relies on an inhaled medication for treatment is that the worse the condition becomes, the harder it can be for the casualty to medicate. Relievers are medicines that are taken immediately to relieve asthma symptoms. They quickly relax the muscles surrounding the narrowed airways allowing the airways to open wider, making it easier to breathe again. A casualty should take a dose of reliever inhaler as soon as they feel symptoms of an Asthma attack. A casualty who needs to use their reliever inhaler three or more times a week may not be well controlled and should have their medication reviewed. Preventers control the swelling and inflammation in the airways, reducing their sensitivity and the risk of severe attacks. The protective effect builds up over a period of time so they need to be taken every day (usually morning and evening) even when they are feeling well. Preventers do not give immediate or quick relief when the casualty is breathless but instead they reduce long-term inflammation. Preventer inhalers usually contain a low dose of chorticosteroid medicine. 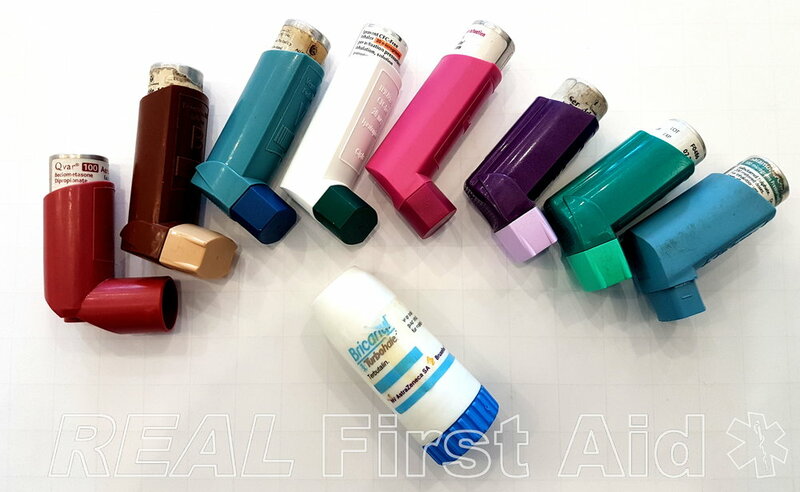 Preventers are usually brown, red or orange inhalers. Preventer inhalers will not relieve the symptoms of an Asthma attack and should never be offered to a casualty where a reliever inhaler is needed. Spacers are large plastic or metal chambers which have an aperture at one end for the reliever inhaler to fit. The space enables the medication to be aerated, making it easier to inhale. Remember that asthma attack are often caused by triggers so attempt to remove the causalty form the trigger. Sit the casualty down, on a chair or on a floor against a wall. Do not attempt to lie them down. Loosen anything around the casualty's neck; the first couple of shirt buttons or an inch or two of zip. Look into the casualty's eyes and hold their attention. Ask “Yes” or “No” questions which they are able to respond to without talking. What to do if there is no inhaler? Inhaled medications are prescription medicines. It is illegal to administer such a medicine without the prescription of a doctor. Read this article on the control of medicines. You may be in a position or responsibility of handling the casualty's medication. Read this article to for further guidance on the handling of medicines. There are several types of inhaler, each with their own mechanism of use. The type of inhaler represents part of the prescription and will have been prescribed to the casualty for a reason. While all blue inhalers tend to be for relieving asthma symptoms, they do not all contain the same drug, nor the same dosage. Don't assume all inhalers are the same. If there is no inhaler present continue to rest and calm the casualty - do not underestimate the power of emotional support. Give positive statements such as "Stay calm" as opposed to "Don't panic". The brain hears the verb first and has to process the fact that the instruction is a negative. What does someone climbing a ladder do immediately after you shout "Don't look down!" ? If there is no sign of improvement after 5 minutes, the casualty's breathing becomes undetectable or they loose consciousness, call 999 immediately.